Raphael, everybody’s favourite Teenage Mutant Ninja Turtle. * His namesake, Italian Renaissance painter, Raphael is also a favourite of his period; he continues to be admired and sought after the world over. 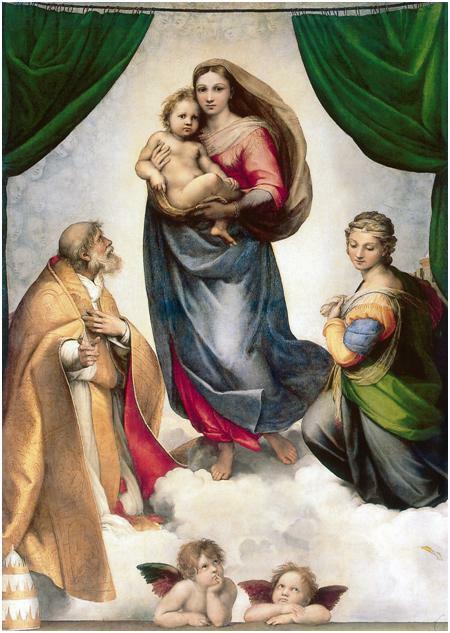 Among his (the painter, of course) most famous works, The Parnassus (1511) and The Miraculous Draught of Fishes (1515), is the Sistine Madonna (below). This work, both simple and beautiful, still raises a lot of questions. Why is Mary’s face already one of concern, much like her general disposition when standing next to Christ on the Crucifix? What’s the deal with the ghostly images in the background – are they souls or cherubs? To whom is Saint Sixtus referring with his pointed finger? Is it the same person by whom Baby Jesus and Mary are entranced? And, most importantly, is Rafael turning over in his Pantheon grave at the idea of the two wistful cherubs, probably the least considered at the time of painting, becoming such a stylised and kitsch image of the 19th century and thereafter? Oil on canvas, 269.5 x 201 cm. Gemäldegalerie Alte Meister, Staatliche Kunstsammlungen, Dresden. I certainly cannot answer any of these questions. However, I can imagine the splendour and awe that come with standing before Mary’s everlasting beauty and eternal posse. Who will meet me in Dresden? See the Sistine Madonna and her iconic cherubs for yourself at the Gemäldegalerie Alte Meister exhibition of The Sistine Madonna: Raphael’s iconic painting turns 500, on until 26 August 2012. Also, cherish these images in print or on your e-reader with this Raphael ebook. *Based on a poll of five people.